The impressive brick gatehouse is what remains of the castle here of the Scales family. Not open to the public. This very fine example of early brickwork stands in the low ground near the railway, three miles S.E. from King’s Lynn. It is the gatehouse of the castle which once existed here, the seat of the Scales family, but of which structure all the rest has vanished. Hugh de Montford obtained the manor at the Conquest, and in the reign of Henry II. it belonged to Roger de Scales, who had obtained it through his wife Muriel, whose great-grandson Robert was summoned to Parliament (19 Henry III.) by the title of Lord Scales. His son Robert attended Edward I. in his expedition to Gascony, and in Scotland (29 Edward I. ), dying four years after. The grandson of this baron, also Robert, Lord Scales, was called by Edward III., in his thirty-first year, to the siege of Calais, “with all the power he could raise.” The estates passed from father to son, till the death of Lord Robert, who accompanying Henry V. into France, was killed (7 Henry V.) at the siege of Lover’s Castle in Normandy (Blomefield), when his brother Thomas succeeded him. This baron behaved gallantly in the French wars, with the regent Duke of Bedford, and was made a Knight of the Garter, being always a staunch Lancastrian. On the entry of Edward, Earl of March, into London, with the Earl of Warwick, Lord Scales secured the Tower of London, and held it for King Henry, but a few days after, when the victory of Northampton (July 14) had thrown all the kingly power into the hands of the Yorkists, and Edward returned to London with the captive King, the forces in the Tower declared for the victors, and Lord Scales, endeavouring to escape in a wherry, to take sanctuary at Westminster, was recognised by some men of Warwick’s, “who waylaid and slew him with many darts and daggers, and his body was left all bloody and naked at the gate of the Clink” (a prison). His son dying a minor, the property went to his sister Elizabeth, who married (2 Edward IV.) Anthony Wodevile, or Woodville, son and heir of Richard, Lord Rivers, the Lord Treasurer, and the father of Elizabeth, Queen to Edward IV. This Anthony was made Lord Scales by Edward IV., at whose death in April 1483 he was seized by the order of Richard, Duke of Gloucester, and imprisoned at Sheriff Hutton Castle, Yorks, where he made his will, bequeathing this castle, which was then known as Tirington Hall, to his brother, Sir Edward Woodville. Shortly after he was carried to Pontefract Castle, and beheaded as a pretended traitor, together with Lord Richard Grey (son of his sister, Queen Elizabeth), Sir Thomas Vaughan, and Sir Richard Haute. On the accession of Henry VII., Elizabeth, daughter of Sir J. Howard, and wife of John de Vere, Earl of Oxford, was found heir to Elizabeth Lady Scales, and thus Middleton came to this great Essex family ; but on the subsequent failure of their heirs male, it went by an heiress, in 1577, to Latimer, Earl of Exeter, whose heiress sold the property to Sir Thomas Holland in 1621. In 1757 it passed to Sir Roger Mostyn, whose nephew possessed it in 1808. The old fabric remained in a partly ruined state until about twenty years ago, when it was purchased by Sir Lewis W. Jarvis of Lynn, who by the exercise of considerable taste restored the gatehouse to a habitable condition, and added a large wing on the site of a former building. 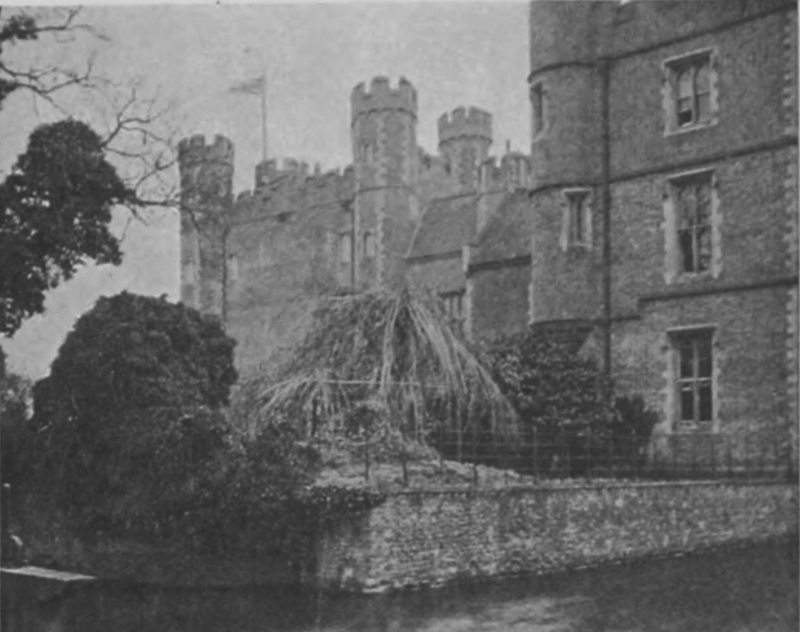 Middleton Tower, although acting as a gatehouse to other buildings, is a substantial mansion in itself, resembling in this the structures of Oxburgh, in the same county, of Mackworth, Derby, Saltwood, in Kent, and others. It can scarcely be dignified with the name of castle, but built in an age when domestic comfort was sought, it was sufficiently defended against any sudden hostility. It is an oblong structure, 51 feet long by 27, and 54 feet high, built during the reign of Henry VI, of small red bricks, probably of Flemish make. At each of the three angles is an octagonal turret, and at the fourth a square one containing the staircase. The gateway is low-pointed, and over it is a good oriel window, with the arms of Scales, six escalops on a shield in a garter. The archway on the N. side admits to a courtyard about 84 yards by 46, where some of the buildings and lodgings stood, and the whole is surrounded by a wide moat, supplied with running water by a small stream. My Father, Dr A G Leakey introduced me to The Middleton Estate in 1952 or thereabouts when he was physician to Mr Ramsdens gamekeeper and his wife for, a mr and Mrs Sporne.. In those days the blacksmith lived beside station road and close to Middleton Tower and was still busy shoeing horses and hammering iron into useful everyday articles. With Mr SPORNE and his son Patrick I learnt to shoot with a .3 garden gun and then a 4.10 and loved my days at the keepers cottage found just off a bend in the road nearer the village of Middleton. I walked over every inch of the Ramsden estate from Fen Wood down beside the railway to Double wood near the A47 road at the other end of the estate and loved every minute of my time with them. I was there at the time when the Hunt met at Middleton Towers and Mr Ramsden, a very wealthy landowner and business man was seen by the press and by those attending the meet to have holes and darts in his socks. These, for me were wonderful days. There was also a mr and Mrs Belton who lived close by the huge moated gate house and also their son who farmed the land close by and their two boys one of whom is now an estate agent of some note.